With summer here and 4th of July festivities just around the corner, lots of people start thinking about BBQs. Burgers and hot dogs are usually the go-to menu, simply because they’re so easy. You know what else is super easy and can be prepped ahead of time? Ribs. I cook my ribs based on Emeril’s recipe in this cookbook: Prime Time Emeril: More TV Dinners From America’s Favorite Chef I make his Orange Chipotle Glaze, which is ah-mazing. I combine equal amounts of Chinese Five Spice, kosher salt and fresh cracked pepper in a bowl and rub into both sides of the racks of ribs. If you don’t have a smoker, no worries. Wood chips can usually be purchased in any grocery store, near the charcoal. 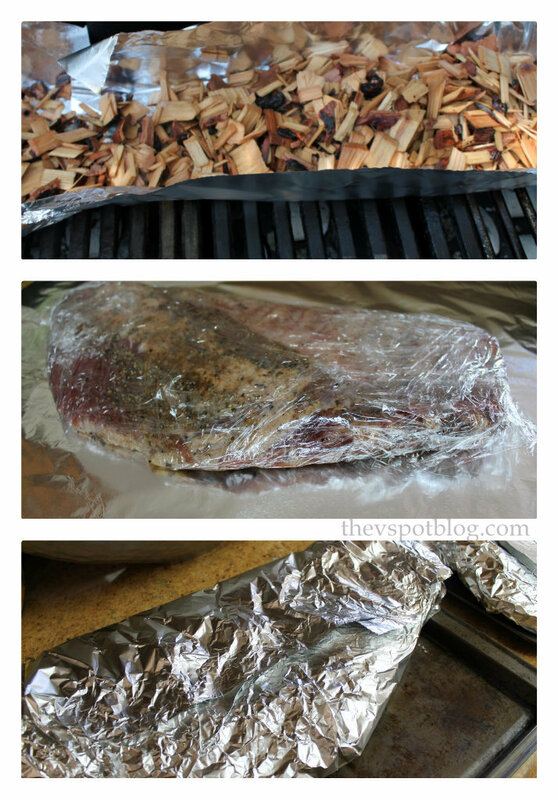 Soak the wood chips in water for at least 30 minutes. Set your gas BBQ to low, or get your coals to a nice low temperature. You want it about 250 degrees or so. Make a foil “trough” for the wet wood chips to sit in, put it on the grill and close the lid. When the chips start smoking, add the racks of ribs. Bake them for about an hour and a half at 350 degrees, then let them sit about 20 minutes. 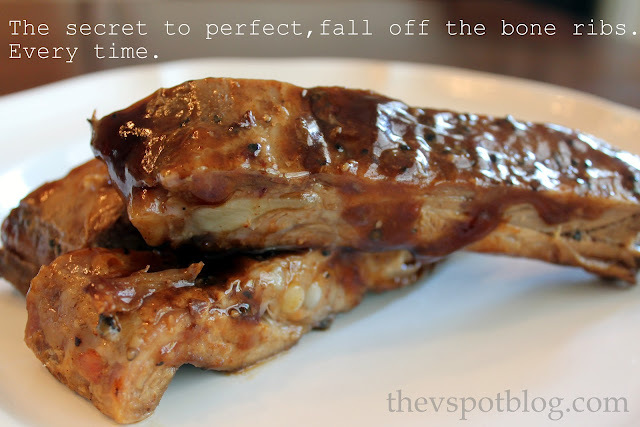 Unwrap, coat with that fab glaze or your favorite BBQ sauce and cut apart. You can cook them up, cut them and then just keep them warm until your guests arrive. Easy-peasy! I am with Katie. I find ribs intimidating to tackle at home. My John will be amazed and thrilled if I give this a shot. Thanks, Viv. Oh YUM! We have a smoker and I love ribs. I have done this before with the saran wrap, and I TOTALLY forgot about it. Thank you for reminding me, and I am pinning your recipe. It looks delicious. I use Emeril recipes about once a month at least, I have for years. I have yet to make something from one of his recipes that we didn’t find over the top delicious.